On Friday, the kids celebrated their last day of school. 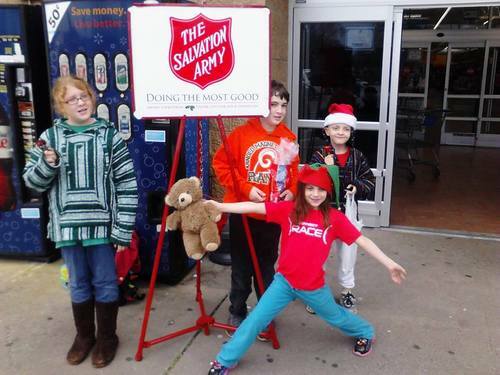 On Monday, they were back at work, but instead of taking tests and writing assignments, they were doing a different type of job: helping the Salvation Army. But the response they got from the Wal-Mart crowd helped show them the true spirit of Christmas. Our son and daughter, Val and Zach, who joined my nephew and niece, Jason and Sophia, have become used to this sort of pre-Christmas charity activity. I blame my mother for this. She had us help make hundreds of little care packages for kids at an orphanage across the border with Mexico in La Ciudad Juarez every year. I can't say it was always fun, but it was always worth it when you saw the kids run to us to get their Christmas goodies. In previous years, our kids have helped locally at the Food Closet, the Clothing Closet, and giving out lunches at a local soup kitchen. So they went in to their work with their usual level of enthusiasm. But our latest task would be the toughest assignment yet. The location that we would help was in a community which has been hit pretty hard by textile mills and other businesses leaving the area. Nearly one-quarter of the county lives below the poverty rate, and the homeownership rate lags behind the rest of the state. Today, it's coping with massive flooding, just like the rest of our region. Our kids threw themselves into their help. My niece did cartwheels with her Teddy Bear, while the others rang the bells with such enthusiasm that you could probably hear them across the entire parking lot. And we sang carols to anyone who donated. Val, Jason, Sophia and Zach helped me get into the holiday spirit with their enthusiasm. And donate they did! Nearly everyone who came by gave something to the Salvation Army. Some put in a lot more than I would have ever expected. One lady emptied her coin purse into the kettle. People lined up to give, and hear their song. By the end of our long shift, my nephew could barely lift the kettle, and the dollar bills could barely fit in the slot. It was like a packed mailbox just before Christmas. You'd never guess that a town with so many needs could give so much. Did the kids make a difference? I obviously don't have a money county. But for the 20 minutes that I rang the bell by myself, while my daughter organized the makeshift sack lunches that we packed, we had the fewest people contribute. My wife noted that we were hardly the only ones who thought of this idea. She mentioned that a mother and her kids were outside a Piggly Wiggly in our West Georgia town, ringing the bells as she got some of our Christmas baking supplies. They received a great deal of interest outside the supermarket. But as much as the kids threw themselves into their holiday performance, all of us got even more than we bargained for in the process. An elderly veteran saluted the kids. An African-American family joined us in singing "Joy to the World." A father told me about his son, who had died in a car crash earlier in the year, explaining why he was making his donation. A pair of Hispanic ladies made a request of the song "Felice Navidad," one of the favorites of all four kids. And a smile came to the face of nearly every person who passed us, even if there wasn't one before when they approached or exited the store. They put those who usually look down on "The Wal-Mart Crowd" to shame. But that's usually the way it works. When you give up some of your time for others, you get more back than you put in. Just don't be afraid to ask your kids to help.